THE HIGHLIGHT OF Saturday's eighth anniversary party at Second String Music is the Bedford Memorial Beer Can Bowling Invitational. Sheryl and I are very excited about it. We are not sure why it's called "Invitational" because you are playing if you walk into the store Saturday. But it sounds good. It will start around 3 p.m. and be inside, because the salted sidewalks in front of the store just aren't up to snuff right now. Our first one was one year ago. Frank Haxel, Adam Yates and I invented the game. We had to make the pins during a Friday happy hour and it was rough and took about an hour, but we did it. We line up 10 beer cans in front of a contraption made by Frank. We take the rug off the floor by the stage and Frank meticulously marks out the spot for each can. Then we mark off about 35 feet to the throwing area by the counter. Wait a second ... I just made a recycle run and we are out of cans again! This means we will need to start over on Friday afternoon. I think we will be OK. I looked for Frank's contraption the other day and couldn't find it because it got brought upstairs at some point, and we cleaned the second and third floor landings in January, and never clean up if you expect to find something later, but we will find it. I think Sheryl knows where it has been put. You get three throws. Each of the 10 cans is worth one point. The cans are reset after each throw. If you hold a beverage while you throw, you get one bonus point. Frank won it the first year and it's kind of a fog - store parties can do that to you. But I think he had the angle figured out or something. We use one of Angus' balls and it isn't exactly round anymore, so you have to throw it with spin or something. We think Frank may have cheated. So we wrote "Shut Up Frank" on the trophy. "Shut Up Frank" is Cori Lyssy's nickname for Frank. She says it a lot, even when he isn't here. BTW, Steve Rees' father made the trophy and it's a thing of beauty. 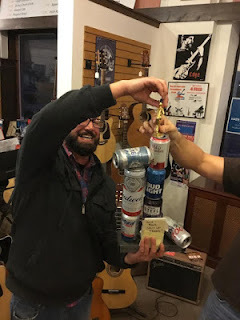 Pete wins and breaks the trophy. Then during our Saturday Before Thanksgiving Party, controversy erupted when Pete Magliocco won it. His first throw was very poor and he stepped over the line, and for some reason one of the marshals gave him a replacement throw. This marshal received a lot of wrath for the ruling. Wait. The marshal was ... me. So I screwed up and in a moment of weakness I gave him another chance. Turns out Pete's total beat my total by one pin, so I ended up screwing myself out of the title. There was a lot of howling and chest beating and threats to call the police (who were already there) until somebody said "It's time for the SoCo toast!" and everybody forgot about it. Then he broke the trophy. Or somebody did. (It's been fixed by our resident trophy repair person, Steve Rees.) Our memory of the epic store party is a bit ... foggy. If you know what we mean. I hope you join us Saturday. Bring your top Beer Can Bowling game, because it's bound to be epic again.